Can you solve this challenge? Results and certificates were posted on Monday June 2nd. The Boundaries are: Rg 49+; Au 30-48; Ag 22-29; Cu 14-21. After five successful years of online challenges, there are 180 puzzles that are available to students and teachers. The entry level question for one of the challenges, chosen at random, is shown above. The other challenges can be found by clicking "The Online Challenge" panel below. We hope you have enjoyed the challenges as they came out, however, there are no plans to release new puzzles. 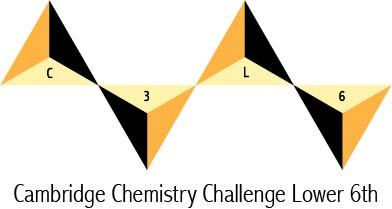 If you have feedback on the Cambridge Chemistry Challenge email us using feedback@c3l6.com.